The following verse is from chapter 10 of the Bhagavad Gita, in which Lord Krishna, the source of all creation, speaks of his divine powers to his closest disciple, Arjuna. And in the night sky I am the moon. From the earliest times, men and women must have wondered about the sun, the moon, and the stars in the heavens, the forces governing the storms and the cycles of light and darkness. Even those of us who are not astronomically inclined must have had moments when we asked the sun, “What are you doing there?” or the stars, “Are you friendly with one another?” Now, in this century, astronomy has developed high-powered instruments for looking beyond the galaxy we live in to probe a universe much vaster and more wonderful than we had ever imagined—a universe in which there are billions of other galaxies, each with millions of solar systems, all held together in the embrace of a unifying force. There is no possibility of anything in the universe—a sun, a star, or you and me—existing separately. To me, this unifying force is the infinite love of the Lord, operating on the physical level. Just as all of us are one, so all things in the created universe are one in the Lord. That is why he is called Vishnu, “he who is everywhere.” When the Lord puts his arms around creation so that it can work in harmony, this is love on a cosmic scale. Just as people live together as a family fostering each other’s welfare and happiness, so the cosmos is a family in which every member is related. If even a distant planet like Neptune or Pluto were removed from the solar system, life here on earth would be a little different for us all. There is no possibility of anything in the universe—a sun, a star, or you and me—existing separately. Each part derives its significance from the whole, which is what the mystics call the indivisible unity underlying all life. When Sri Krishna says he is the sun, this can be interpreted with both scientific precision and spiritual wisdom. The sun is the source of heat and light, both of which are necessary for life on earth. We can ask ourselves, “How has it been possible for the sun to give out this heat and light continuously for more than six thousand million years?” The astronomer and the physicist account for this heat in terms of hydrogen being converted into helium. With a dramatic touch they compare the sun to a hydrogen bomb exploding continuously for millions of years, and they add that it takes twenty million years for this energy to reach the sun’s surface from its center, where the temperature is thirteen million degrees. But they cannot tell us why this process goes on or who is responsible for it. For this we have to draw upon the wisdom of spiritual insight. I like to imagine Sri Krishna standing quietly in the center of the sun in an incomprehensible whirlwind of heat and light, playing on his magic flute. On a hot summer afternoon, when the temperature in our city goes up to ninety-five, my friends come home exhausted and consume gallons of iced lemonade. Now imagine the Lord, whom we are calling Sri Krishna, standing comfortably in the midst of thirteen million degrees and playing on his flute. If he were to play a little louder the temperature of the sun would go up, affecting life on earth; even a small rise in the earth’s temperature and we could not survive. And if the Lord should allow his hidden melody to become a little softer, the temperature of the sun would fall, again making life on earth impossible. The question that any scientist would ask is, “How is it that this thirteen million degrees at the center of the sun gives the perfect temperature for life on earth?” It cannot be dismissed as an accident. According to the Gita, the sun has an inner law—or, to be more personal, an inner ruler—which maintains a perfect balance of energy, pressure, and temperature. This balance is an expression of the divine unity of existence, which keeps all the local forces working together so that the unity of the solar system may be maintained. 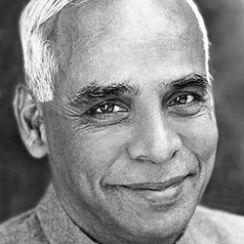 This excerpt from Like A Thousand Suns: The Bhagavad Gita for Daily Living by Eknath Easwaran is reprinted with permission from Nilgiri Press. Sri Easwaran is the founder and director of the Blue Mountain Center of Meditation in Tomales, California. His books include Meditation, Gandhi the Man, and Take Your Time: Finding Balance in a Hurried World. For a catalog, write to Nilgiri Press, P.O. Box 256, Tomales, CA 94971, or call 707-878-2369 or 800-475-2369.